As the title suggests, this predominantly covers Batman’s origin story, from the death of his parents after he becomes scared at the theatre, through his training by Liam Neeson’s Ducard, his development of a crime-fighting persona and his confrontation with his former mentor in a city ridden with toxin-crazed criminals and madmen. This is arguably the most realistic, or at least vaguely plausible comic book movie ever made, with the only real superpowers on display being a gas that makes people insane and a ridiculously vast fortune to funs Bruce Wayne’s double lifestyle. Granted, the secret passage in Wayne Manor is operated by hitting a coded sequence of piano keys, but this can be forgiven, and is at least a variation from the classic sliding of a secret book on a shelf. The film has become criminally underrated since the release of the cinematic behemoth that was the Dark Knight, but Begins gives more room for Christian Bale’s Batman to breathe, as opposed to battling for screen time with the Joker and Two-Face. Not that Begins is light on villains, as alongside the aforementioned Ducard there is Tom Wilkinson’s mob boss Carmine Falcony and Cillian Murphy’s malicious Scarecrow, whose mask is genuinely unsettling. Padding out the good guys are Morgan Freeman’s tech-wiz Lucius Fox, Gary Oldman’s police commissioner Gordon and, of course, Michael Caine’s introduction to a new generation of fans as Wayne’s butler Alfred. 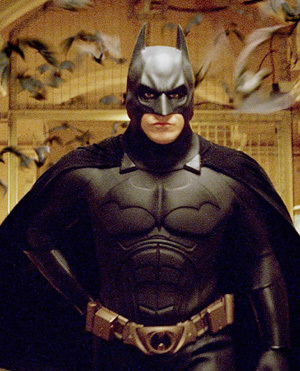 Certainly at times it is easy to lose track of who’s hitting whom in the fistfights, director Chris Nolan’s Batarang approach to plotting seems to suit the film better than it does the audience and somebody really needs to tell Katie Holmes to just stop being in films, but this is still one of the better superhero films in an ever increasingly crowded genre. You should await the forthcoming Dark Knight Rises with a barely concealed level of glee. This entry was posted in 08/10, 5-Star 500, Choose Film, Empire Top 301, Empire Top 500, Review, TF 100, The List and tagged Batman, Batman Begins, Christian Bale, Christopher Nolan, Cillian Murphy, Gary Oldman, Katie Holmes, Liam Neeson, Michael Caine, Morgan Freeman, Tom Wilkinson by jaycluitt. Bookmark the permalink.